The Association of Community Organizations for Reform Now’s (ACORN Canada) latest campaign is getting set to launch. This year they want to make politicians sit up and notice there needs to be improvements to the social assistance system. 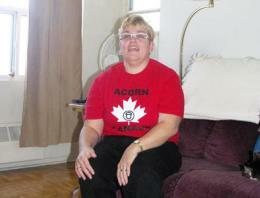 ACORN [Canada]’s purpose is to fight for social justice for low income families across Canada. There are 30,000 members in 20 neighbourhood chapters in six Canadian cities. “We are focused on two points in this campaign – to increase the rates of Ontario Works and the Ontario Disability Support Program and ensure that the special diet allowance program remains in place,” ACORN board member Kathleen Fortin said. The meeting will address member’s issues and work on building a strategy on how to get the attention of provincial candidates, MPPs and opposing parties as they get ready to start their 2011 election campaign across Ontario. Fortin said she hopes they will be able to make candidates take note of the needs of those living on an Ontario Works income. The special diet allowance helps people on Ontario Works and on Ontario Disability Support program manage their health needs, such as diabetes. The McGuinty government announced in March 2010 that changes to the special diet will take place, meaning some who were once eligible for the extra $250 a month allowance will no longer be eligible. Fortin wants the special diet allowance to also be addressed because of concerns members have had about notices they received questioning their diet needs. “It seems right now they are tying to revise the special diet allowance and we want to make sure it remains the same, if not better,” she said. Fortin, who has been on Ontario Disability Support program, receives $723 a month. After rent, utilities, food, transportation and personal items such as shampoo, she has little left. “Each month gets harder and I am left with less money for food,” she said. Fortin indicated she hopes this meeting will make politicians aware that there needs to be improvements to the system. “Our status is not going to change, so the only change that needs to happen is a change in the rates for the better,” Fortin said. The group held a meeting on Jan. 11 and is now planning a rally for Feb. 14 that will call for improvements to both the Ontario Works and Ontario Disability Support programs at the Ministry of Community and Social Services offices on Preston Street.